This is a new high-grade wireless number keyboard with full size 22 keys. Features reliability, ease-of-use, and user comfort, this numeric keypad will improve your work efficiency. You deserve it! MULTI-FUNCTION 22-KEYS NUMBER PAD Numeric keypad supports NumLock, ESC, Tab, Delete etc. With shortcut key which can open the computer calculator directly. 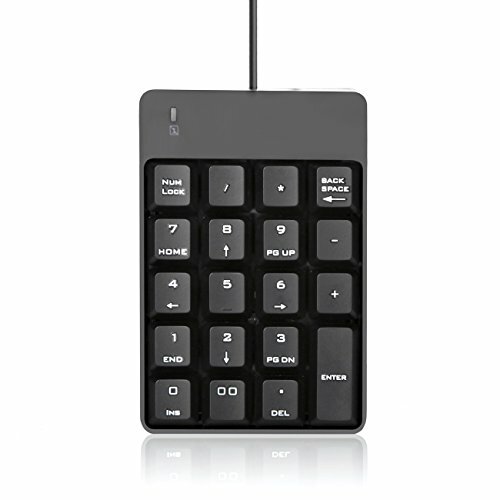 The Muli-Function 22 Keys Wireless external number keypad for laptop is more unique than most keyboards. Lekvey 34-Keys is a keypad you can really rely on to work with your Bluetooth-enabled PC - no receiver required. 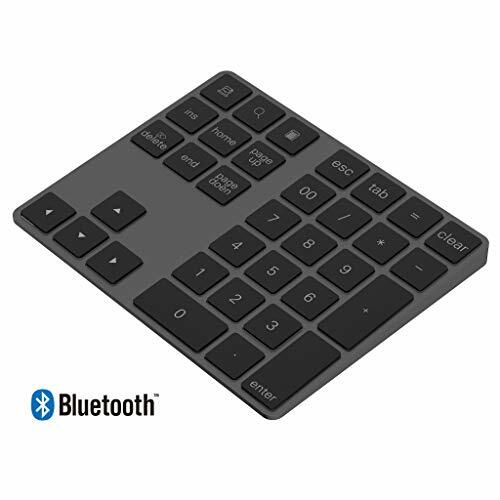 Whether you use a laptop, desktop, Mac or Windows tablet, this is the only Bluetooth wireless keypad you need. 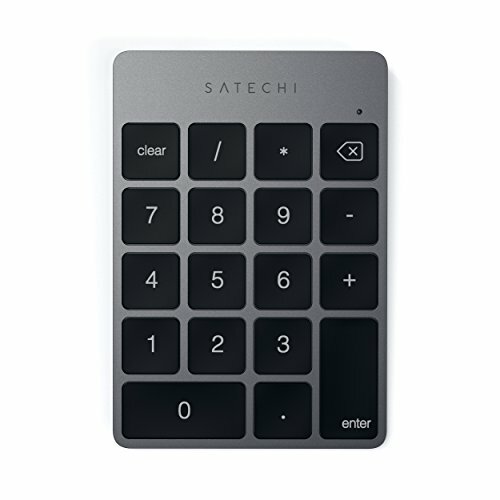 This Aluminum Bluetooth number pad features solid aluminum coating and ergonomic tilt design, compact Apple-style pad perfectly match your apple magic keyboard and bluetooth devices. 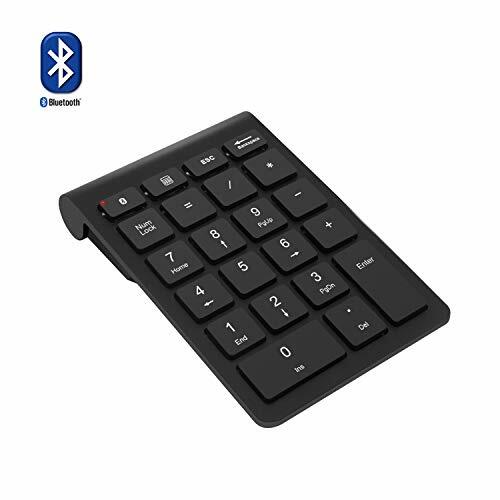 This Bluetooth keypad has 34-keys with multiple useful shortcuts which can meet all you need of a number keyboard! With wireless Bluetooth connectivity Technology, it works almost anywhere with no dongle or transceiver to lose from the coffee shop to the park bench. After first use, the keypad will auto connected every time you when you turn on keypad bluetooth again. (1) Mac OS 10.0 above, IOS 9.2 and above, compatible with iMac, Macbook, Macbook Air/Pro. (1) In the Mac OS system, firstly manually open the calculator program on iMac or MacBook, then input the number on the keypad to run the calculator function. (2)In Windows system, directly press calculator key to run the calculator function. The led light shows red when charging and turns off after charged fully. When start pairing, the light will be flashing blue and stops after pairing successful. SLIM ALUMINUM DESIGN: Lekvey Bluetooth number pad is constructed of solid and premium aluminum materials for long-lasting use, the ergonomic tilt for comfortable typing and good look, slim style appearance ( Only 0.46lb, 5.7*4.4*0.47 inch ), perfectly matches your Macbook, MacBook Air / Pro, iMac, PC, surface pro, laptop or desktop as the side external numeric keypad. HIGH-CAPACITY RECHARGEABLE BATTERY: Built-in 160mAh lithium rechargeable battery. The Bluetooth numeric keypad is easily recharged through the included USB cable, no need to change the battery and user- friendly. The Bluetooth wireless keypad also has the auto sleep function, lower power consumption, reflect energy saving and humanization of the product. Press any key can wake up the keypad within 3 seconds. 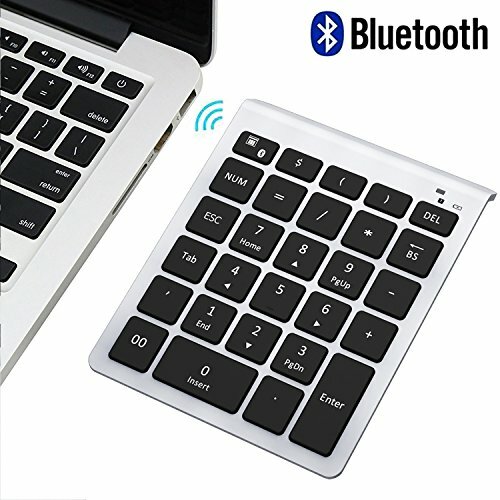 WIDELY COMPATIBLE: This Bluetooth wireless number pad it includes shortcut keys and low profile quiet scissor-switch keys so you can work comfortably on your computer or laptop. Compatible with Mac OS, Windows, Android, iMac, MacBook Pro, MacBook Air, MacBook, Surface Pro 4 / Pro 3, Samsung Tablet Smart Cellphone PC Desktop laptop, etc. HAPPY CUSTOMERS, 100% QUALITY GUARANTEED & 2 YEARS WARRANTY. Every Lekvey Bluetooth number pad will go through a strict quality test process before sending out, as we promised to bring the best quality Bluetooth keypad to our customer. What's more, you get a 2 years warranty and lifetime technical support for your investment. Please feel free to contact us if you have any request, we will solve your problem within 24 hours! For businesses that handle high-volume numeric tasks, the Wirezoll 18 keys USB Wireless numeric keypad enables a more streamlined, efficient workflow. The keypad can be attached to your computer or to a kiosk, creating a dedicated space for numeric data entry. Avoid dropping the wireless numeric keypad and otherwise subjecting it to severe impact. Never bend or twist the case. Never try to take the wireless numeric keypad apart. Wipe the unit with a soft dry cloth to clean it. PlUG-and-PLAY Keypad: no drivers required; USB port required. Full-size 19mm keys Number Pad improves speed and accuracy by making it easier to locate and press the numbers you are looking for. Mechanical Blue Switches Professional mechanical Blue switches with tactile bump and audible click, Provide fast and precise key presses. Plug & Play No drivers required; USB port required. Supports NumLock, ESC, Tab, Delete etc. With shortcut key which can open the computer calculator directly.. Extreme Durability Ensures 50 million times keystrokes, Never Faded Key Characters. Aluminum and ABS construction stand up to tough conditions. Gold-plated interface and magnet ring can to a large degree guarantees stable data transmitting. 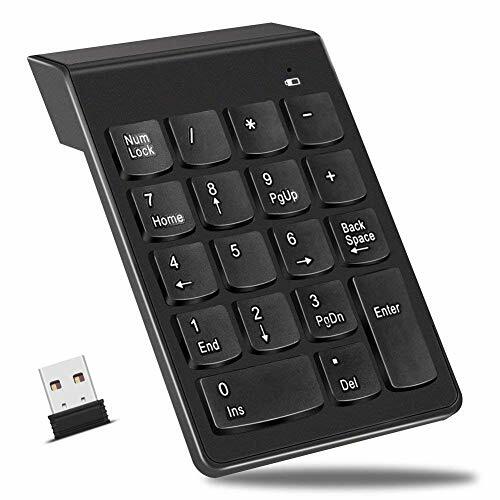 This keypad has 22-keys with multiple useful shortcuts including NUMLOCK, DEL, Backspace, ESC, Tab, Home, End, Page up/down and calculator export button, etc. Meet all you need of a number keyboard. Very portable number pad allows you to carry it anywhere easily, fits your handbag and backpack without taking much space. The number pad grips the desk well and doesn't move around with the rubber pad. Bluetooth works perfectly without a dongle. Awesome and essential for laptops. 3) Run the Bluetooth Setup Assistant on your computer or phone and select "Bluetooth Keypad" from the list. 4) When Bluetooth Setup Assistant page shows the "Bluetooth keypad" being connected successfully, you can type numbers into Excel Sheet by this keypad to see whether it is really successful. Upgraded Version Keypad : Compared to our ordinary Version keypad, it supports NumLock, ESC, Backspace, Del etc. With shortcut key which can open the computer calculator directly. Great accessory for Small Laptops Without A Separate Keypad. 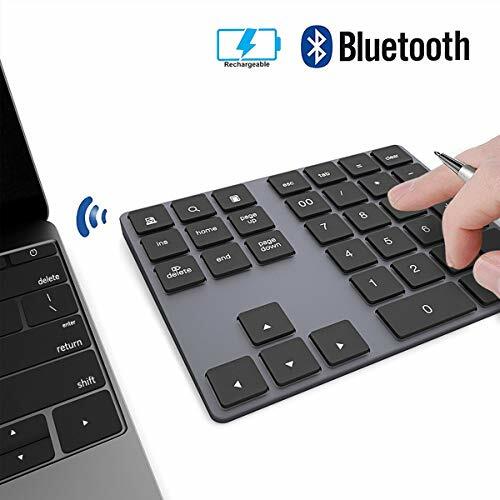 Bluetooth 3.0 Connection : Bluetooth 3.0 technology provides a cable-free & clutter-free connection, the external 10-keys full keypad extends your existing keyboard, operating distance 10m. Power Saving: Power Supply by 2* AAA Batteries not included ; It enters into sleep mode automatically, energy saving, extended battery life; Any key to awake up the keypad. 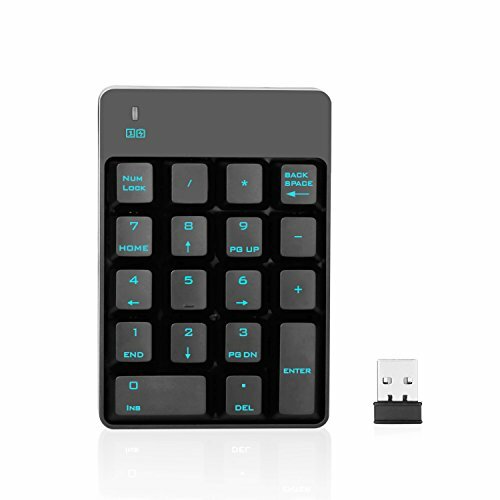 USER FRIENDLY : Full-size 22 keys, soft buttons for this Multi-Function wireless Number Pad. Keys are easy and less noise to press, greatly speed up your productivity. Ergonomic tilt and anti-slip pads on back provides optimum comfort. COMPATIBILITY :Compatible with Windows 98SE /ME /2000 /XP /Vista /7/10, Linux 2.4 or above operating systems. Numeric keypad is not fully compatible with Mac system (Function keys do not work, while number keys part works fine). It has a comfortable ergonomic and Floating -key without a shell wraps design. Compare with the other standard keypad, the 21 keys extended some keys at the top, contain Esc,Tab,Back Space,and FN keys. 4 keys are increased to numeric section and thus more functions can be realized through the keys combination with FN. 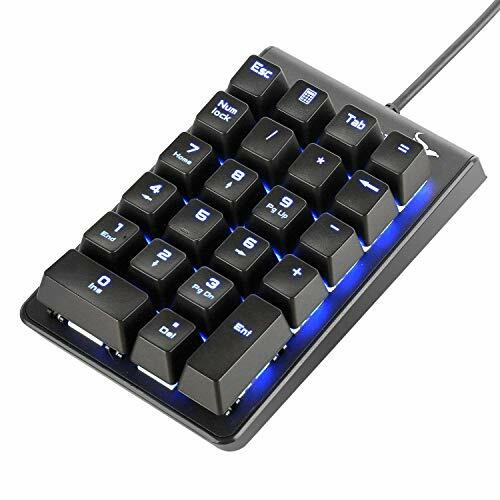 The num lock function is independent of any other keyboard that are currently connected.The mechanical switch keypad can ensure a fast response. Mechanical numberic keypad has 4 backlight model and 6 backlight brightness can be adjusted. By simultaneously pressing the FN key and another key, you can change the backlight and brightness. Hot keys available: Pressing FN+ESC to turn on computing device, FN+ TAB to turn on left bracket, FN+ Backspace to turn on right bracket, FN+ NUM to turn on equal symbol, FN+ / to turn on $, FN+ * to turn on and FN+ - to turn on . 1. Good for laptop users. 2. Suitable for banking, financial securities, business workers. 3. Used in counter register. 4. Used with 87 keyboards, 82 keyboards, 68 keyboards, 61 keyboards and other keyboards without numeric section. Compare with the other standard keypad, the 21 keys extended some keys at the top, contain Esc,Tab,Back Space,and FN keys. Magicfore Qisan 21 keys enhanced mechanical numberic keypad has 17 numeric keys and 4 additional keys,including tabesc and FN. By simultaneously pressing the FN key and another key, you can input parentheses, an equal sign, currency symbols, or activate the calculator. 21 keys mechanical numeric keypad is suitable for laptop users,banking, financial securities, business workers or Used with 87 keyboards, 82 keyboards, 68 keyboards, 61 keyboards and other keyboards without numeric section. 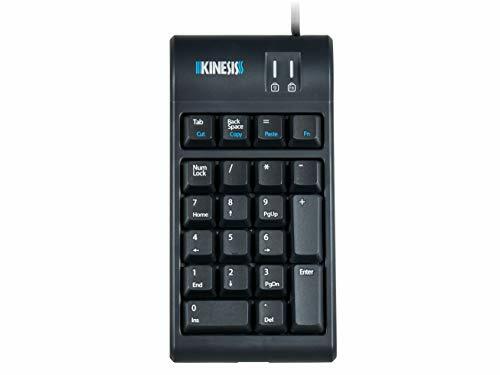 The Freestyle2 Numeric Keypad for PC by Kinesis matches the low-profile design of the Freestyle2 ergonomic keyboard and utilizes the same low-force, quiet and tactile membrane key switches. The Freestyle2 keypad allows flexibility in positioning the keypad to the right or left of the keyboard and is perfect for narrow keyboards like the Freestyle2, or in conjunction with your laptop. Use it in any situation where a standalone keypad is preferred. The 2-port USB hub enables you to easily connect other input devices such as a mouse, without having to access USB ports on your computer. IDEAL ERGONOMICS: A external keypad is the optimal ergonomic solution for intensive 10-key users. A full-size keyboard forces you to always reach around the 10-key to use the mouse, causing harmful shoulder and elbow strain. But a "tenkeyless" keyboard paired with an external keypad allows you to position the keypad and mouse in the most comfortable and convenient positions based on the task at-hand. PERFECT COMPANION FOR FREESTYLE2 KEYBOARD USERS. The Freestyle2 keypad from Kinesis is designed to match the feel and styling of our popular Freestyle2 split keyboard. The FS2 keypad uses the great key switches and has the same slim styling. PLUG-AND-PLAY ON WINDOWS 7-10: The Freestyle2 keypad is specifically designed for Windows users and doesn't require any special software or drivers. The keypad works on other operating systems but hotkey functionality may not be supported. CONVENIENT HOTKEYS BOOST PRODUCTIVITY: Use time saving Cut, Copy, and Paste macros to speed up your workflow and eliminate awkward key combinations. GREAT TYPING FEEL AND PERFORMANCE: The keypad features full-size, low-force membrane key switches with tactile feedback for maximum comfort, without the noise of a mechanical switch. 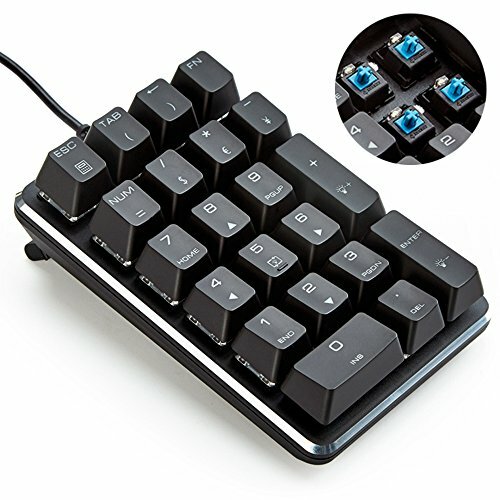 This JOYEKY number pad has 34-keys with shortcuts key for extending your existing keyboard, it makes date entrying more fast and accurate. 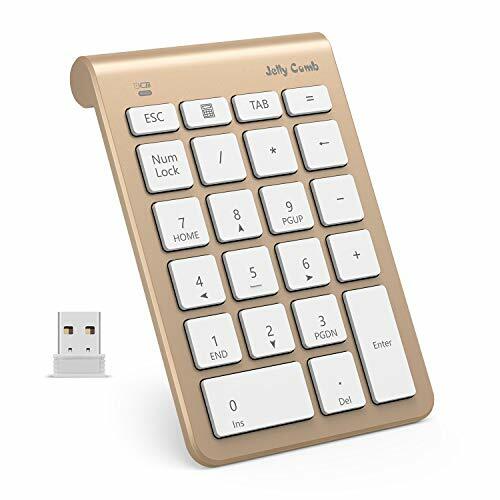 -This silm wireless keypad features solid aluminum coating and ergonomic tilt design, compact Apple-style pad prefectly matchs apple magic keybord and bluetooth devices. ---Supprot Mac OS 10.0 above, IOS 9.2 and above, compatible with iMac,, Macbook, Macbook Air, MacBook Pro, iPhone and iPad. (2)Home, end page up, page down can not work with Mac OS and IOS system, other keys work well. [Silm Aluminum Construction]: JOYEKY number pad is constructed of solid and premium aluminum materials for long-lasting use, the ergonomic tilt for comfortable typing and good look , slim Apple-style appearance, perfectly matches your apple magic wireless keyboard as side external numeric keypad. 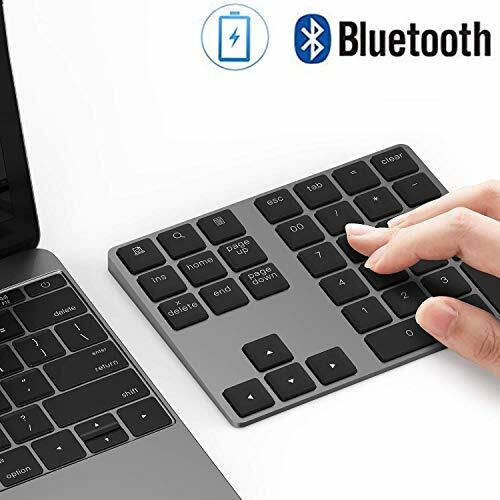 [Bluetooth 3.0 Connection]: Connected via Bluetooth 3.0, Just pair the number keyboard with mac or laptop via the pairing button on its backside, paired up instantly and easily, it will be auto connected after the first use. Built-in rechargeable battery for long-lasting use. [COMPACT & COMFORTABLE TYPING]: The island-style chiclet keys enables convenient and quick type. Ultra-slim design makes wireless keyboard easy to put into your travel bag. We provide 1 year worry-free warranty & 30-day money-back guarantee, feel free to contact us for any concerns. 1 Choose "Browse my computer for driver software"
2 Choose "Let me pick from a list of device drivers on my computer"
SIMPLE SETUP: It's easy to get started-you just plug the receiver into a USB port and start crunching numbers right away. Keys are easy and silent to press, greatly speed up your productivity! A must have for the numerically inclined. SOLID, PORTABLE DESIGN: This sturdy number entry-solution is easy to take with you, so you can work confidently and quickly-wherever and whenever. USER FRIENDLY: Battery indicator light lets you know when the keypad's AAA battery is running low. Conveniently located direction control keys can be used as joystick control, allowing you to feel the thrill of playing game using a wireless device. 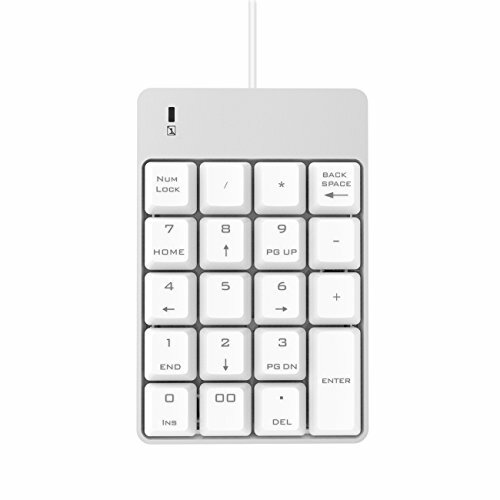 The Aluminum Slim Wireless Keypad is the perfect accessory to complete your work space. Featuring a full numeric keypad, the Aluminum Slim Wireless Keypad is a great wireless solution for extending your existing keyboard. With a slim profile and sophisticated finish, this keypad offers both style and functionality. The Aluminum Slim Wireless Keypad uses Bluetooth technology, making it compatible with any Bluetooth-enabled device. Use the keypad to help keep your work space free of clutter from wires and plugs. Thanks to the sleek and slim profile of the keypad, you can easily fit it into any backpack, bag, or purse. Have access to the Aluminum Slim Wireless Keypad wherever you go! The Aluminum Slim Wireless Keypad features a rechargeable battery, with a charge lasting up to two weeks and a charge time of 1-2 hours. To conserve battery life, the keypad will go to sleep after inactivity. Works with Bluetooth-enabled MacOS, iOS and PC devices. See below for Windows 10 pairing process. Does not support ChromeOS and Microsoft Surface computers. To pair your keypad, please place keypad in pairing mode and open Windows Control Panel. Click "Add a Device" > Select "ST-WK31" or "Bluetooth Calculator Keypad" > Click on words "or try entering a passcode on it" > Enter unique passcode into keypad > Press "Enter" on keypad. 2. Portable & Ergonomic Design, easy to carry wherever you go. Your hand wrist won't hurt even you use it for a long time. UNIVERSAL COMPATIBILITY: Works with PC, desktop computer, laptop, notebook. Compatible with Windows 2000 / XP / Vista / 7 / 8 /10 operating systems. NOTE: This number pad is NOT fully compatible with Macbook OS system. Function keys do not work, while number keys part works fine. 2. Portable design, smaller than normal calculators, easy to carry. 3. 18 function keys with ROUND caps, completely control. 4. Share ONE usb receiver. 5. With rubber non-slip mats on the back, reduce the friction of keyboard and desk, keep stable and not moving optionally. Support PC laptop Desktop with Windows 2000/ Me/ 98/ XP /Vista/ 7/ 8/10 system. Light weight and compact design makes it both nice and practical. 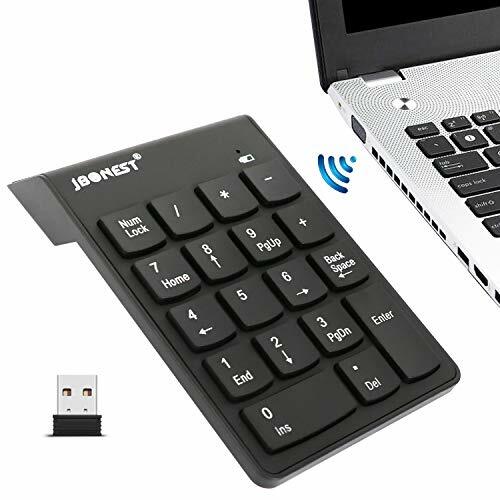 Take this thin and compact keypad in a laptop bag or briefcase to efficiently enter data wherever you go. Great for those working on spreadsheets, accounting files or financial applications. Never miss it! This keypad has 22-keys with multiple useful shortcuts including NUMLOCK, DEL, ESC, Tab, Home, End, Page up/down,calculator button, etc. Meet all you need of a number keyboard. The full-size 22-key layout and membrane key-switch technology reduce typing noise, improve response and provide low-profile keystrokes for fast and accurate data entry. Compatible with PC, laptop and desktop computers that have Windows 2000 / XP / Vista / 7 / 8 / 10 systems. Numeric keypad is NOT fully compatible with Mac OS and Apple iOS system. (Function keys do not work, while number keys part works fine). 1.The 2.4G receiver is unrecognized? If the receiver is not recognized,Pls check the USB interface is is in good contact. 2.Why the red light always twinkle when in use? When the keyboard indicator is flashing red during use,it indicates that the battery is about to run out of power. Pls replace the battery as soon as possible. 3.Does the device show that the wireless keyboard is disconnected? The 2.4G wireless keyboard mouse automatically enter into sleeping mode to saving power in 2 minutes without operation. Press any key can awake up the keypad, and the wireless connection will be automatically restored. Mini Digital Keyboard Durable The number pad are rated for more than 5 millions of keypresses, which is way above and beyond the standard duty expectation of a membrane keypad.The keyboard is spill-proof,so the letters on the keys are also durable made.The letters will not wear off after long time use. 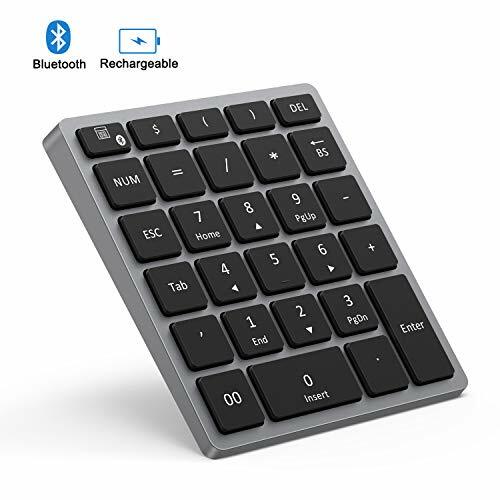 Portable Number Pad Membrane Key Switches: Reduce Typing Noise, Improve Response and Provide Low-profile Keystrokes.The ergonomic tilt angle prevents wrist strain.The slim design makes the keyboard easy to put into a travel bag. Numeric Keypad Auto Power The wireless keypad uses 1*AAA battery , and the keyboard has an automatic sleep mode to maximize battery efficiency.Press any key can awake up the keypad.  ImportanceCompatible with PC, laptop and desktop computers that have Windows 2000 / XP / Vista / 7 / 8 / 10 systems. Numeric keypad is NOT fully compatible with Mac OS and Apple iOS system. (Function keys do not work, while number keys part works fine). ERGONOMIC DESIGN - Integrated ergonomic tilt provides comfort which helps reduce strain; The great spring action and comfortable key sizes respond quickly, improving your work efficiency, great for those working on spreadsheets, accounting files or financial applications. POWER SAVING - It will auto power off when not in use for 10 minutes, effectively increase the battery life. UNIVERSAL COMPATIBILITY - Lefon wireless number pad works with PC, laptop and desktop computers that have Windows 2000 / XP / Vista / 7 / 8 / 10 systems. The wireless 18-key numeric keypad is Not fully compatible with Mac OS. 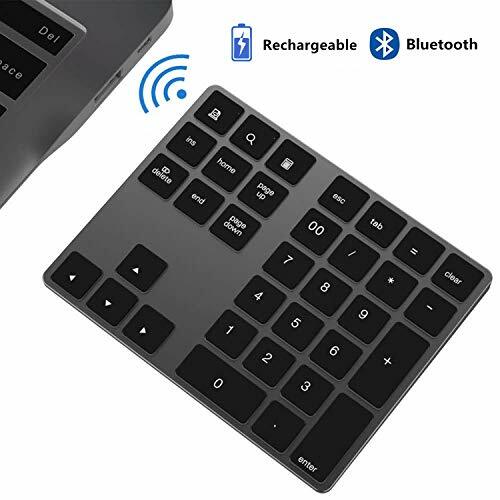 Cateck Ultra Slim Wireless Bluetooth 34-key Numeric Keypad with Multiple Shortcuts for Windows/Android/iOS/OS system Device ! This keypad has 34-keys with multiple useful shortcuts including NUMLOCK, DEL, ESC, Tab, Home, End, Page up/down, bonus symbols keys and calculator export button, etc. Meet all you need of a number keyboard. The Wireless Keypad uses Bluetooth technology, making it compatible with any Bluetooth-enabled device. Use the keypad to help keep your workspace free of clutter from wires and plugs. 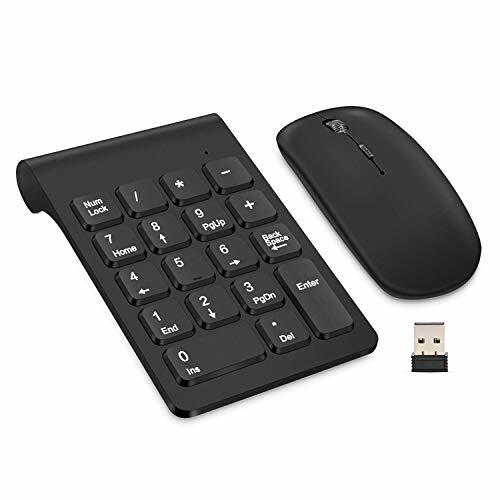 MULTI-FUNCTION 34-KEYS NUMBER PAD: Full-sized 34-key with Numlock, Delete, Tab & More, Use the wireless keypad with 28 function keys including backspace, home, end, tab and more to assist in accounting tasks, excel spreadsheets, and more to expand your existing keyboard. 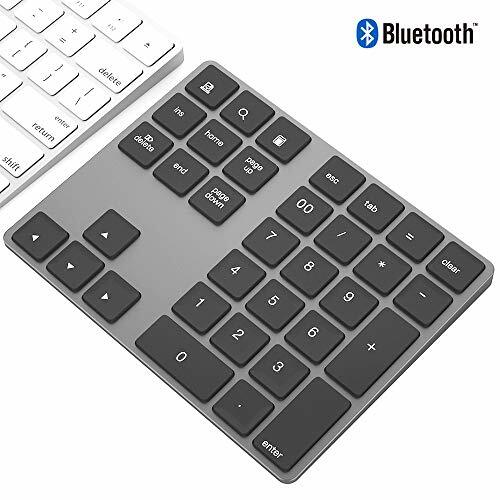 BLUETOOTH 3.0 CONNECTION: Just pair the numeric keypad with your computer to enjoy wireless technology lifestyle. Please kindly check the User Manual to see how to pair Bluetooth successfully/ If you have any question about Bluetooth Connection or others, Please feel free to Contact our Support Team. We will try the best to assist you. Thanks ! IT'S SMOOTH, VERY SMOOTH: The gratifying tactile feel of the keys will titillate your senses and inspire you to do your very best work. The scissor-switch technology makes sure that even the softest keystroke is enough, relieving any unneeded stress while typing. ERGONOMIC DESIGN: The ergonomic design and the half-height buttons also help prevent wrist problems. Rubber Pads on back provide optimum comfort and securely keep the keypad in place. Time is Money! You Need An Excellent Numeric Keypad to Make Things Easier! This numeric keypad makes it much easier and faster to type numbers and perform calculations on a computer than trying to use the numbers at the top of the keyboard. You could easily type "518+176" and press Enter with one hand. You won't have to use both hands or look down at the keyboard. 4. Size & Weight: 146*114*11 mm, 126g. 5. Supported Systems: Windows, Android, OS, iOS. 6. Power Supply: Rechargeable lithium battery. 1. Please charge about 2 hours before using for the first time. 2. Slide the power switch to green side, the blue indicator will be on. 3. Press pair button, the number pad will enter pairing condition while the blue indicator keep flashing. 4. Turn on Bluetooth for your device, search and add the "Bluetooth Keypad" to your device. 1. Function keys feature may have variations depending on the operation system version and devices. 2. Calculator shortcut is not available on iOS and OS system devices. 3. Only one device can be actively paired one time, once connection established, your device will connect to the keypad automatically when you switch on the keypad in future use. 4. In case of connection failure, please delete the pairing record from your device, and try to connect again. One-handed Operation Great for working on spreadsheets, accounting files or financial applications, you can easily type numbers with one-handed operation. Practical shortcuts help get your work done faster and more efficiently. Widely Compatibility High speed and stable Bluetooth 3.0 widely compatible with most Bluetooth-enabled Windows / Android / iOS laptop, PC, tablets, iPad, iMac, MacBook. Slim and Durable High-quality aviation aluminum alloy shell makes it stylish, lightweight and durable, 3~5 million designed life of the keystroke. Ergonomic Design X-scissor keys construction and ergonomic tilt design make it a soft touch, mute and comfortable for typing, helps reduce the strain on the wrist. What You Get 1 x 34-key number pad, 1 x USB cable, 1 x user manual, 60 days money-back and lifetime worry-free warranty. Item Dimension : Length: 5.7 inch, Width: 4.5 inch, Height: 0.35 inch . Rest assured that all our Bluetooth keypad have unconditional 24-month product warranty including Replace or Refund, also we provided you lifetime easy-to-reach technical support. If you have any questions about the product or anything else once you receive the bluetooth keypad, We will respond quickly and work on the issue with you until you are 100% satisfied. ERGONOMIC SLIM ALUMINUM DESIGN -- This Aluminum Bluetooth number pad features solid aluminum coating and ergonomic tilt design, The ergonomic scissor-switch design help prevent wrist problems. Comfortable typing with ergonomic scissor-switch design and good look, slim style appearance , only 5.7 4.5 0.35 inch, 4.1 oz . Perfectly compatible with Windows, Android, iOS and OS System Laptop, PC, Tablet, Ipad Imac, Macbook etc. BLUETOOTH 3.0 CONNECTION --Bluetooth 3.0 technology provides a cable-free & clutter-free connection, Operating Distance: 10 m/33 Feet . The bluetooth keypad will auto connected every time when you turn on keypad bluetooth after you first connected with bluetooth connectivity technology . 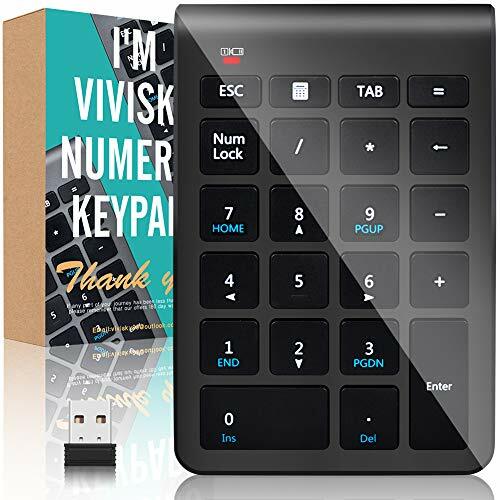 WIDELY SYSTEM COMPATIBILITY -- This numeric keypad is perfect for smartphone, laptop, desktop and tablets, ( Please make sure your device with bluetooth enabled ) Compatible with Windows, Androids, iOS and OS operation system. The pad includes powerful shortcuts keys , such as delete, Search, Calculator, Home, ScreenCapture, ESC, Tab keys etc. to expand your existing keyboard. Note: Calculator,ScreenCapture, Search and ins Key is not comatible with OS system, but other keys work well. THE VERY BEST CUSTOMER SERVICE -- Rest assured that all our Bluetooth keypad have unconditional 24-month product warranty including Replace or Refund, also we provided you lifetime easy-to-reach technical support. If you have any questions about the product or anything else once you receive the bluetooth keypad, We will respond quickly and work on the issue with you until you are 100% satisfied. Mechanical switch : The number pad features mechanical switch that ensure a fast response. The blue switch is the most rhythmic clicky feeling. The Mechanical switches are designed for longevity with greater durability and responsiveness. More than 50 million keystroke times. Compared to other ordinary Version keypad, it supports NumLock, ESC, Tab, Delete etc. With shortcut key which can open the computer calculator directly. The Numlock function is independent of any other keyboard that are currently connected. Ergonomic design: The number pad for laptop integrated ergonomic tilt provides support to help prevent wrist strain , ideal for those working on spreadsheets, accounting files or financial applications. Plug and play, USB connection, no device drivers, is an ideal choice for spreadsheet accounting and financial applications. No battery required, don't have to worry about your number pad for laptop will be no power. The number pad is suitable for users of laptops users,banking, financial securities, business workers. It is also a great accessory for Small Laptops Without A Separate Keypad. Hot keys available - pressing fn+esc TO turn on computing device, FN+ tab to turn on (; FN+ backspace TO turn on ); FN+ Numb TO turn on =; FN+/ TO turn on $; FN+ * to turn on and FN+ - to turn on. This Acedada Bluetooth wireless keypad has 18-keys with ten numbers and multiple useful shortcuts including NUMLOCK, Home, End, Del, Page up/down etc. It makes accountants to enter dates more quickly and accurately. Meet all you need of a number keyboard! It is easily connected with mac or laptop via Bluetooth 3.0, after first use, the keypad will auto connected every time you when you turn on keypad Bluetooth again. 1) Switch ON/OFF button on the top to power the keypad. 2) Press the Bluetooth key for 3 second until the LED indicator light flashing turn blue. 3) Go to system preferences>Select device>Add device. 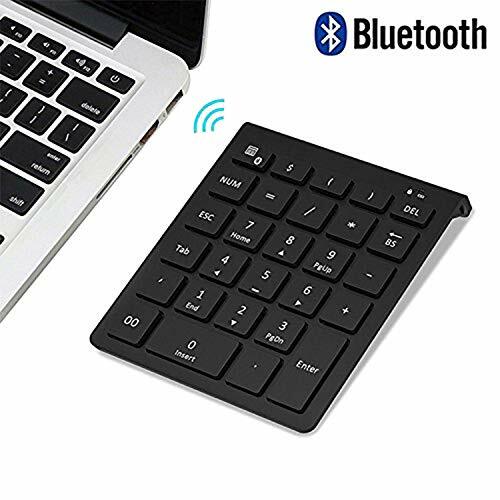 PORTABLE AND SLIM DESIGN : New high-grade slim wireless Bluetooth number pad, small and lightweight, simple style and save space layout. It's perfect for business travel, you can easily put the number pad into your backpack or bag and take it along with you anywhere! It is the best choice for your office or business trip! Ergonomic tilt design reduces wrist strain for the most comfort. RECHARGEABLE WIRELESS BLUETOOTH KEYPAD : Built-in 280mAh lithium rechargeable battery, no need to change the battery and use friendly, Very convenient It also has an auto sleep function, lower power consumption, reflect energy saving and humanization of the product. Just press any key can wake up the Bluetooth keypad. 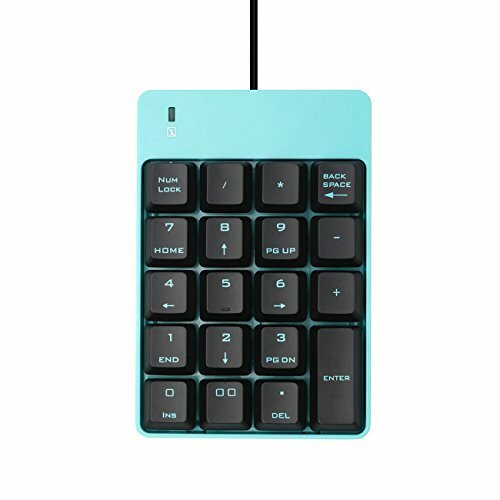 COMFORTABLE AND SMOOTH TYPING : Advanced scissor switch Bluetooth number pad, quiet soft touch and fast rebound, help you to enjoy a comfortable and smooth typing experience; Professional full-size big letters Bluetooth numeric keypad assists financial accounting task, excel spreadsheet and more. Ensures 50 Million times keystrokes and provide precise key presses. UNIVERSAL COMPATIBILITY : Widely compatible with Mac OS, Windows 2000/ Me/ 98/ XP /Vista/ 7/ 8/10. Works with your iMac, MacBook Air, MacBook Pro, Android, Surface Pro, cellphone, notebook, PC, and laptop. BUY WITH CONFIDENCE -- Acedada is committed to providing 100% customer satisfaction by delivering top quality products, backed with great value and excellent service, unconditional 24-month product warranty ( Replace or Refund ) as well as lifetime technical support. 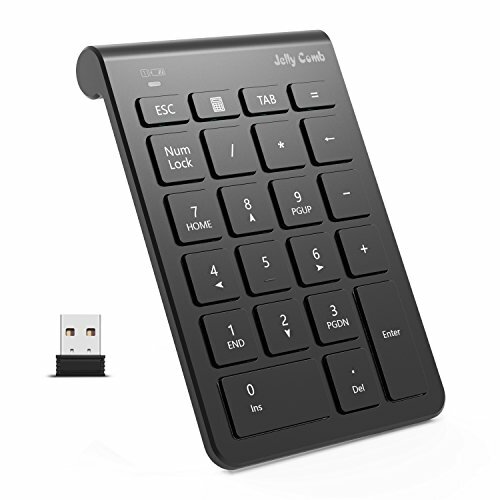 Jelly Comb Bluetooth 28 keys number pad, is a perfect match for your keyboard, laptop or notebook to finish your financial accounting data entry tasks, help to enjoy fast speed and wireless technology lifestyle. Built with lithium battery, easily recharged through included USB cable, no need to change the battery. 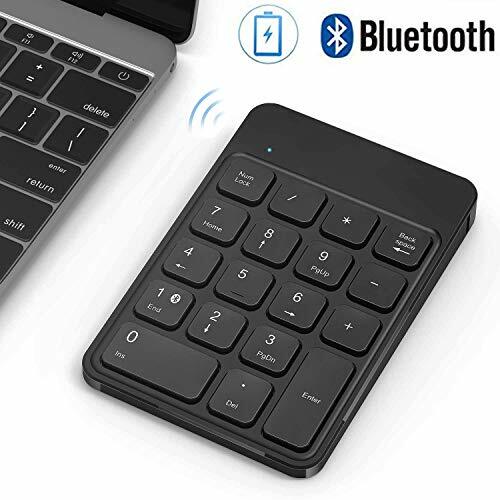 Applied with Bluetooth 3.0 technology, just pair the number pad with your computer to enjoy clutter-free wireless technology lifestyle. 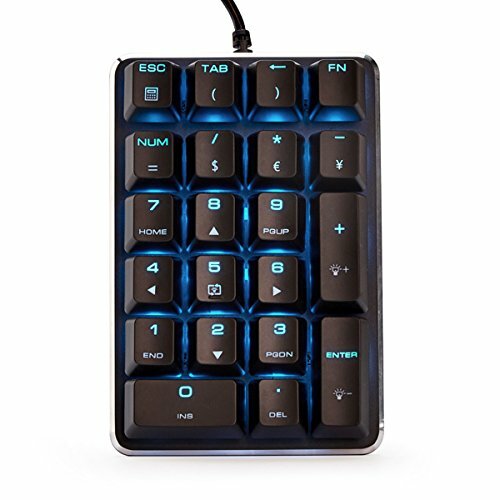 The 28 keys number pad is built with multiple useful shortcuts including NumLock, ESC, Tab, Delete,Home, Page up/down, Computer Calculator button. Meet all you need of a number keyboard. Easy to carry along anywhere; help to reduce the wrist strain for the most comfort. The wireless numeric keypad will auto sleep to save power when not in use for 20 minutes. You can press any key and wait for 3 seconds to awake the keypad. NOTE: This number pad is NOT fully compatible with Macbook OS system and Apple iOS system. Calculator Key and Functional Keys(home, end, Esc, Pgup, PgDn and arrows) can not work but other number keys work well. Advanced BLUETOOTH 3.0: Bluetooth 3.0 technology, provides a cable-free & clutter-free stable connection, easily pairs with your Bluetooth-enabled devices to enjoy fast speed and wireless technology lifestyle, effective range up to 10m. 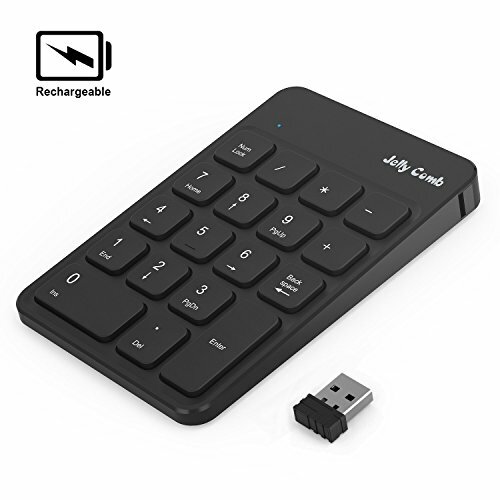 RECHARGEABLE CONVENIENCE: Built-in 350mAh lithium battery, the wireless numeric keypad is easily recharged through included USB cable, no need to change the battery. MULTI-FUNCTION 28 KEYS FOR EASY USE: Added with NumLock, ESC,Tab,Delete and more function keys, shortcut key opening the computer calculator directly, more efficient than most keypad, this 28 keys number pad meets all your needs and greatly improves your working efficiency in excel spreadsheets, accounting task and financial applications. USER FRIENDLY: Advanced scissor switch keypad, quiet soft touch and fast rebound, help you to enjoy a comfortable and smooth typing experience; Ergonomic tilt design reduces wrist strain for the most comfort. Small and lightweight, you can easily put the number pad into your bag and take it along with you anywhere. COMPATIBILITY: Works with tablet, cellphone, laptop, notebook, PC, desktop and computer, widely compatible with Windows 2000/ Me/ 98/ XP /Vista/ 7/ 8/10 system, Android. NOTE: This number pad is NOT fully compatible with Macbook OS system and Apple iOS system. Calculator Key and Functional Keys(home, end, Esc, Pgup, PgDn and arrows) can not work but other number keys work well.